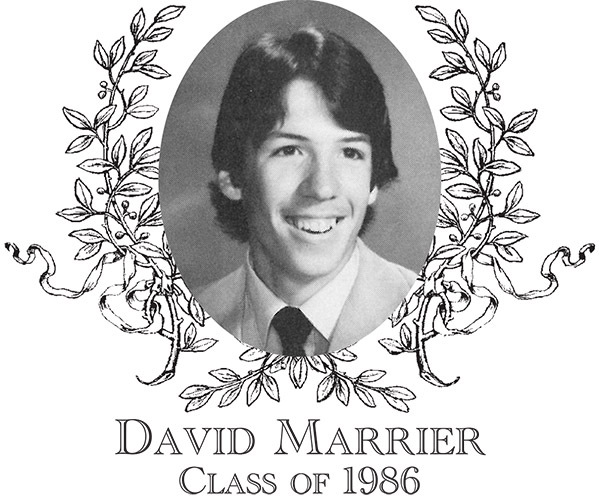 David Marrier, Class of 1986, was a three-sport athlete, playing soccer, basketball, and baseball. David was a four-year starter on the varsity soccer team and is most remembered as the starting goalkeeper his sophomore through senior years. David earned ten shutouts during his career, none more memorable than the season opener his senior year against Auburn where he turned away 13 shots. David was a Captain of his senior year team and was recognized as one of the top goalkeepers in the Border Conference. David played basketball his senior year. David was a center, helping to lead the team to a 15-6 record including the Clark Tournament Large School Championship for the first time in five years. This team later went on to the District quarterfinals before falling to Nashoba Regional High School. David played baseball his sophomore, junior, and senior years and was an outstanding pitcher. David established himself as a pitcher his sophomore year when he threw seven strong innings in the District Tournament. David helped lead the team to back-to-back Border Conference Championships his junior and senior years. During his senior year, David was starting pitcher in four games, earning a shutout in the first and striking out nine and thirteen in his final two starts on their way to a number one seed in the Districts. The team finished with a 16-3 record with a District quarterfinal appearance. David led the team with 2.12 ERA and was selected as a Border Conference All-Star his senior year. Hall of Fame Coach Bob Pepka stated "David had an excellent fastball and curve, along with a decent change-up. Good control and kept the hitters off balance." David attended Franklin Pierce College where he played baseball and was twice selected as an All-Mayflower Conference All-Star for pitching. David continues his involvement with the Bartlett athletic program. He is currently the head coach of the girls' varsity soccer program and also previously coached at various levels in the girls' basketball program. He also coached in several youth soccer and basketball leagues in Webster. David lives in Webster with his wife Michelle and daughters Danielle and Megan. He works at Tri-State Plastic Corp. as a machinist where he has been employed for 25 years.